Take our Florida Traffic Law and Substance Abuse Education (TLSAE) course to qualify for your Learner's License! Our Florida TLSAE course offers these features and so much more! Our course is approved by the Florida Department of Highway Safety and Motor Vehicles. You can take the course completely online (the minimum age to take the course is 14 years old). Qualify for your Florida Learner's License (Note: You must be at least 15 years old to get your Learner's License). We submit your completion to the Florida HSMV for you. Print a FREE copy of your Receipt of Completion for your records. Ready to get out there on the road? In Florida, one of the requirements for first-time drivers to get their Learner's License or their Class E Driver's License is to complete the Florida Traffic Law and Substance Abuse Education (TLSAE) course. TLSAE is a 4-hour course that covers information on traffic laws (including road signs, how to interact safely with other roadway users, and how to drive in inclement weather), as well as information on how alcohol and drugs can affect you and your driving. Safe2Drive makes fulfilling your TLSAE requirement quick and easy. You can complete your TLSAE course completely online. We even submit your completion to the Florida HSMV for you and provide you with a FREE copy of your Receipt of Completion. Simply create an account with a username and password, fill out your contact information, and answer a few personal validation questions to get started. You can even try the course for FREE. You don't have to pay until you're ready to take the final exam. Note that you must be at least 14 years old to take the course. The 4-hour course is divided into 10 short lessons on topics ranging from the physiological effects of drugs and alcohol to how to drive safely in bad weather. Each lesson is full of fun videos, animations and games. At the end of the course is a 40-question multiple-choice final exam. You must score at least 80% to pass. Most people pass on their first attempt, but you can take the exam as many times as you need to get a passing score. The entire course is online and can be completed on any mobile device. Complete it on your desktop at home or on your phone or tablet on the go! Once you pass the course, we automatically submit your completion information to the Florida HSMV for you. Please note that it takes approximately 48 hours for your course completion to be annotated on your record once we report it. You can also print a receipt of your completion for your records for FREE. Complete the Traffic Law and Substance Abuse Education Course (Please note that you can take the TLSAE course when you are 14 but you cannot get your Learner's License until you are 15). Pass the permit test (if you haven't taken your permit test yet, check out our online permit test or our TLSAE and permit test bundle for a discounted price). You must pass the permit test (if you haven't taken your permit test yet, check out our online permit test or our TLSAE and permit test bundle for a discounted price). We understand you're eager to meet the necessary requirements and get your Florida driver license. That's why we've gone the extra mile to make sure the process is quick and easy for you. Our registration process is short and sweet, and we offer a fun and engaging course that will teach you everything you need to know to be safe out there on the road. You can take your TLSAE course on a desktop, tablet, or even your cell phone! Once you pass, we'll report your results to the DHSMV for you! It's as simple as that. 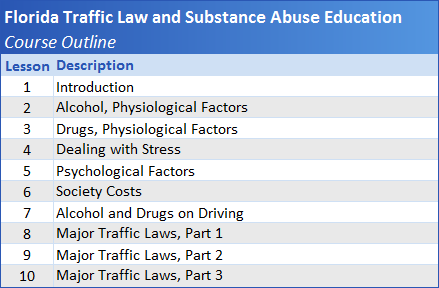 What is the Traffic Law and Substance Abuse Education course? Safe2Drive's Traffic Law and Substance Abuse Education course is a 4-Hr online program that you must complete as part of your qualifications for a Learner License. How does the TLSAE course work? The first step is to register. This is easy and takes just a few minutes. You will create a username and password, which allows you to log in to your account as often as you like. Then, complete the course and pass the exam. Safe2Drive will electronically submit your certificate to the Florida Highway Safety and Motor Vehicles Department (FLHSMV) the same day you pass your exam. You can also print a receipt of completion for your records. You must be at least 14 years old to take the TLSAE course. Please note that while you may take the course at age 14, you must be at least 15 years old to get your Learner's License. For most of you, we believe the material will be sufficiently engaging and challenging to require the full time for each lesson. Some of you, however, may finish a lesson before the required time has elapsed. We provide additional instructive exercises and interactive games to help you use up the extra time productively. The course is set up so that you go through it in order from beginning to end. There are ten lessons (Figure 3). Each lesson contains lecture material, videos, animations, and interactive exercises. Take your time, enjoy the interactive features, and learn the material. The course is completed entirely online. At any point in time you may go back and review a prior lesson. During registration you will be asked several questions about things you like and do. Remember the answers to these questions because you will be asked to provide those answers during the course. One question, for example, was "What is your favorite color?" You must answer all validation questions correctly. We are required by the Florida Department of Highway Safety and Motor Vehicles (FLHSMV) to block you from completing the course if you fail a validation question. We are also prevented by the FLHSMV from giving you a refund. Yes. A quiz is given at the end of each lesson. If you pass the quiz, you go onto the next lesson. If you do not pass the quiz, you must take it again until you pass. You can take the quizzes as many times as necessary, so there is no need to stress over it. Each quiz consists of five multiple-choice questions, and a passing grade is 80% or better. The quizzes serve two purposes. First, they give you a good idea if you've absorbed the material. Second, they help you prepare for the final exam. The final exam will contain some questions you see on the quizzes. A final exam is administered at the end of the course. It consists of 40 multiple-choice questions, and a grade of 80% or better is required to pass. We will make sure you are thoroughly prepared! Take your time and go through the material. Take the quizzes methodically. You do this, and you are in great shape for the exam. Most people pass the exam the first time. However, you can take the exam as often as necessary without any additional charge. Again, everyone at Safe2Drive wants to see you succeed. Call or email us anytime if you have questions. Your certificate will be processed the same day you pass the final exam. Safe2Drive will electronically submit your certificate to the Florida Highway Safety and Motor Vehicles Department (FLHSMV). You can also print a receipt of completion for your records. There is no charge for the receipt. You can check the status of Safe2Drive's submission to FLHSMV by logging into Safe2Drive and clicking on "Track My Certificate." How do I get my Learner's License? How do I get my Class E Driver License? What is the TLSAE and permit test bundle? The TLSAE and permit test bundle allows you to take both the TLSAE course and permit test online for a discounted price (you save $6.95). You must complete both the TLSAE course and the permit test to qualify for a Learner's License in Florida.